Hi Matt, Looks like fun. I started doing this and had to back off for a while due to a wrist injury. I’m hoping to take it back up later this year. 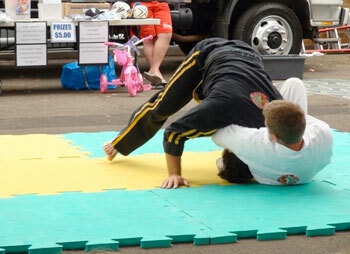 It was fun trying to get used to keeping my limbs out of way rather than sprawling a lot like I used to do in wrestling. Hi John! BJJ is great fun! But those five minute rounds are killing me. Can see how wrestling can help BJJ with its body leverage. If you’re not willing to put yourself in such a ‘bad’ position, you’ll never really learn. I applaud your effort and determination. The beginning is hard in anything you do, but this will help you learn some many other things and not just be comfortable with what you’ve already achieved. Hi dojo, the beginning is definitely hard. I’ve had to put my ego aside and not worry about getting tapped out by other white belts, etc. I have already made great strides, but BJJ is unbelievably technical, so there is so much to learn. They don’t call it “Human Chess” for nothing.